Join our growing team working to build stronger communities in Appalachia! Fahe is on a mission to eliminate persistent poverty, and our work is a reflection of the great people we hire. Our strength lies in our innovation, collaboration, and our differences in viewpoint, background, and experience. 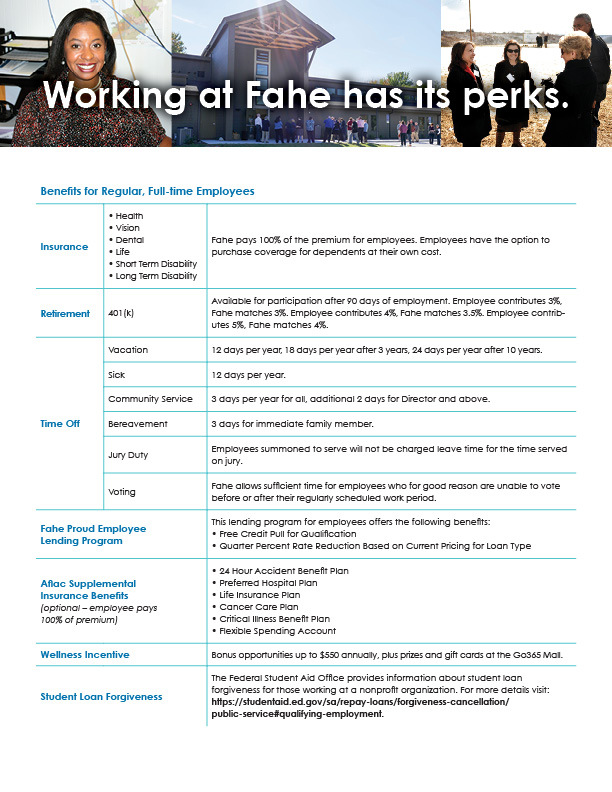 Fahe fosters an environment where all employees thrive. Over the past 10 years, we have more than doubled our number of employees. For the past two years, our staff nominated Fahe as one of the top 100 Best Places to Work in Kentucky. enjoy a welcoming workplace free from harassment, discrimination, and intolerance. At Fahe, we believe talent and outstanding effort should be rewarded by meaningful opportunities to apply skills and training, opportunities to learn and grow, and competitive salaries and benefits that meet employees’ needs during the various stages of their lives. Our employees also have opportunities to come together for fun and healthy activities, such as picnics, employee recognition celebrations, and clubs initiated by employees’ interests. Together, our Network has improved the lives of over 535,000 people since 1980—strengthening our communities through expertise in housing, education, health and well-being, and well-resourced leadership. At Fahe, you’ll join a team working to create local solutions and lasting impact. Each of our employees contributes to our success. Occasionally one of our 50+ Members or partners has a job opening. Below you will find the job description and location information.